A Professor in the Marketing Area Dr Rai has served as Independent Director in Publoic Sector undertakings such as, ITDC (India Tourism and Development Corporation) and MRPL (Mangalore Refinery & Petrochemicals Ltd. a subsidiary of ONGC) of Govt of India. She was awarded Devang Mehta Business School Award 2013, for Best Professor in Marketing Management. She was awarded Associate Fellowship of Indian Institute of Advanced Study, Shimla. She was also awarded Prateek Vidya Bhushan alankaran by Prateek Sansthan, Varanasi, 2004. Dr Rai was felicitated by The Sunbeam Group of Educational Institutions, Varanasi, as a Woman of Substance in 2006 and 2007. She was the Chairperson, Women’s Grievance Cell, Banaras Hindu University. She did her SSCE from Poona Board, her graduation from St. Xavier's College, Mumbai. There after she did her Masters in Economics, MBA, and then PhD in Marketing from Banaras Hindu University. After a stint in the Industry, She joined the Faculty of Management Studies Banaras Hindu University in 1987. She has eight Ph.D’s awarded under her supervision. She has 10 books (authored, co-authored and edited) to her credit. 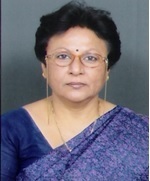 Prof. Rai is a trainer in the UGC Program of Capacity Building of Women Managers in Higher Education. She has convened several National Seminars and Conferences in the field of Management and also Women's Studies. She is life member of several National organizations like Forum for Integrated National Security (FINS), Country Women's Association of India, Indian Economic Association, Institute of Marketing and Management, World Women's Awakening Organization (WWAO), Mahamana Malaviya Mission, etc.